The post-screening discussion ranged far and wide, addressing several areas: the debate as to whether Tobe Hooper or Steven Spielberg directed the film; comparisons to other Spielberg films; the film’s relation to drama and melodrama; the film’s central themes of love and family; how the comedic aspects affected the drama, melodrama and horror; some staples of the horror film gene; parapsychologist Dr Lesh’s function; more specific aspects of the film including set design, particular shots and the use of music; comparisons to non-Spielberg films. As ever, do leave comments or email me at sp458@kent.ac.uk to add your thoughts. We started by referencing Warren Buckland’s Directed by Steven Spielberg: Poetics of the Contemporary Hollywood Blockbuster (Continuum, 2006) in which Buckland analysed Poltergeist’s shot lengths and concluded that the film bore close relation to films directed by Tobe Hooper, rather than those directed by Steven Spielberg. However, the group thought that despite this, the film felt like a Spielberg movie– and he was indeed responsible for the film’s story as well as co-writing and co-producing it. On a very general level, Poltergeist was reminiscent of Spielberg’s Jaws (1975), Close Encounters of the Third Kind (1977), E.T. The Extra Terrestrial (1982) and its mix of comedy quips and adventure/horror very similar to Spielberg’s Raiders of the Lost Ark (1981). It was noted that Poltergeist’s parents Steve (Craig T. Nelson) and Diane (JoBeth Williams) had a similar sense of fun to the parents in Jaws, despite the arrival of children. The fact that the film showing on the family’s TV at one point – A Guy Named Joe (1943) – was later remade by Spielberg into Always (1989) was also commented on as further evidence of Spielberg’s close involvement. It was thought that a reason Spielberg might not have been credited as co-director was that he was exclusively contracted as director on E.T. at the time. So how might the presence of Spielberg’s guiding hand affect the dramatic and melodramatic aspects of the film? 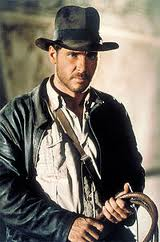 Kat interestingly proposed that Spielberg had ‘blockbusterised’ 1930s and 1940s melodrama. It was agreed that the main connection to melodrama was the emphasis on excessive emotion and the heightened drama. The film’s main themes regarding the power of love and the family and the very high stakes involved – the average American Family under attack from The Beast – were also related to this gesture towards the excessive. In addition, the characters’ relationships with one another were understandably highly emotional. This was aided by the use of non-diegetic music which inspired an emotional response from the audience. As well as at the level of the plot and theme, the cinematic treatment was excessive – the blockbuster special effects for example. This relates well to some of our other discussion about melodrama. Is melodrama most visible at the level of plot (the suffering of characters – as seen in Poltergeist when the family loses its youngest member) or the way in which the story is told? At this point, John Mercer and Martin Shingler’s Melodrama: Genre, Style, Sensibility (Wallflower Press, 2004) in which the authors state that melodrama is perhaps not a genre, but a sensibility or mood was considered. It was also suggested that Poltergeist’s excessive plot and treatment (especially its dramatic, or melodramatic, elements) were what made the film, essentially hokum, believable, at least at the moment of viewing. 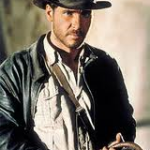 In addition, sentimentality, which is certainly one of Spielberg’s hallmarks, was present throughout the film and is arguably connected to melodrama. This sentimentality contributed to the fact that the film, while it had elements of horror, was not too frightening. We also linked this to the comedy aspect present in several Spielberg films. The squabbling siblings reminded us of a US family sitcom. The sudden intrusion of the horrific elements was therefore in some ways surprising. While this might be thought to lead to extra-shock value, it generally toned down the horror elements as it seemed likely that the familiar comedy component would soon return. It was noted that no one actually dies in Poltergeist – which is highly unusual for a horror film and part of what contributes to its status as a family-oriented horror film. Some more usual motifs of horror were present though. The house was of course revealed to have been built on top of an uncleared cemetery and the family’s ordeal was not over when the characters believed it to be. 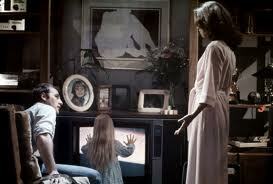 Characters outside the family in Poltergeist were also discussed. 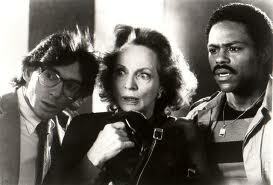 We particularly focused on the parapsychologist Dr Lesh (Beatrice Straight). It was thought to be significant that as an outsider, and one who must to some extent suspend any disbelief she might feel, Dr Lesh functioned as a mirror for the audience. She acted as intermediary between us and the film’s moments of excessive drama. As an investigator of parapsychology she of course only appears after Carol-Ann is abducted – once the film’s drama has become excessive. She appeared to provide a sense of stability for the audience, therefore, and she explicitly acts in this way for Diane. The Doctor promises she will return, and the pair shares an emotional hug which marks Dr Lesh as a mother surrogate. Other specific moments of the film we focused on included the shot which magically lengthened the landing corridor as Diane was attempting to reach the end of it to rescue her children. It was thought that the shot itself seemed out of place with the rest of the film, although the sense of urgency it engendered chimed well with the heightened drama. The pan ‘reveal’ which showed that the proposed housing development would be built on was also commented on. The prominent position the staircase occupied in Poltergeist was focused on. This relates to melodrama in terms of spectacle, although in this instance the stairs’ almost freakishly organic, twisty, appearance was deemed unusual. We also found some echoes of Poltergeist in later films. The plot was compared to that of Labyrinth (1986, Jim Henson), while Poltergeist’s beginning was related to that of A History of Violence (David Cronenberg, 2005) and the bobbing corpses in the back garden to Sam Raimi’s Drag Me To Hell (2010). The latter is on UK TV this Sunday – Channel 5 9-11.05 pm – if you want to catch it. We did not get around to discussing Thomas Elsaesser’s article on the family melodrama, but if anyone would like to do so, just add a comment. It should also bear relevance to next week’s screening. Many thanks to Kat for choosing such an enjoyable, thought-provoking and, at times, quite scary film, and for providing other food for thought!